Aria Group's full service product development facilities are located in Irvine, CA. Aria's 60,000 square foot complex houses its engineering and design groups, providing CAD and digital modeling services, its CNC machine shop, providing 3-, 4-, and 5-axis machining of parts and tooling, full composites facilities including clean room facilities for advanced composite fabrication, Class A paint facilities, a full metal fabrication machine shop, hard modeling and clay modeling studios, as well as secured studio space for confidential and proprietary product development and client design reviews. Aria Group's CNC machining facility provides 3, 4, and 5-axis milling capabilities, utilizing data provided by our clients or our in-house digital modeling/engineering team. The machine shop has been purpose-built to provide fast, accurate solutions using advanced Numerical Controlled (NC) program software and a wide variety of materials from light foam, clay, and steel. Our machines have the ability to machine anything from customer aluminum wheels to a full size SUV or small airplane fuselage in one piece. The department utilizes the latest software such as CATIA V, Mastercam, and Surfcam NC to control the machines. Aria houses a large 3-D production area, including 3-D printers that have the versatility to produce thermoplastic parts with the strength, durability, accuracy, and functionality of traditional parts - without machining of tooling. Our FDM technology is simple, safe, and produces parts in hours, not weeks. The parts can then be used for concept models, functional prototypes, manufacturing tools, and end use parts to name a few. The benefit of this manufacturing method is that it accelerates product development by bringing ideas to life faster and less expensively, and reduces time-to-market. Aria Group employs fiberglass, carbon fiber, and other advanced composite materials to manufacture parts, molds, and complete sets of tooling for clients. The department is approx. 5,000 sqft of dedicated area for composite parts and tooling fabrication. Aria uses high-temp epoxy for molds and components to maintain part stability and to reduce 'print through'. Aria uses both a large high-temp oven and Autoclave which are big enough to cure a fullsize composite vehicle. The department also boasts an Advanced Composites area housed inside a 1,300 sqft clean room specializing in wet-lay-up and pre-preg carbon fiber. Aria has the ability to digitize parts and components no matter how small or large in size. The digital laser equipment we use is a portable Nikon K600 with an Optical CMM system. The scanner is handheld which allows the user full freedom to scan large objects. 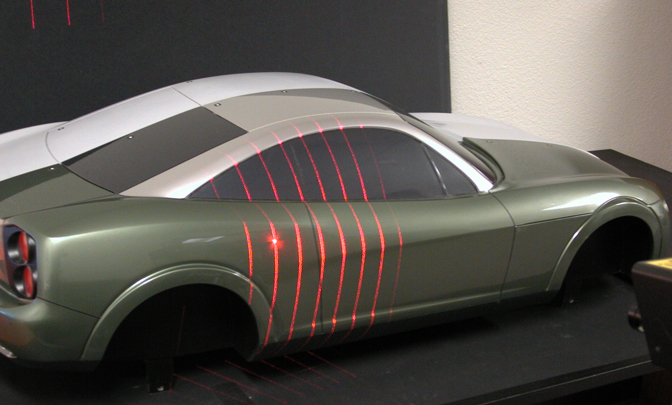 The scanner is equipped with a laser stripe of 100mm, which allows the user to scan not only large objects but also allows scans of tight areas with great details and precise accuracy. Aria Group has an on-site paint and surfacing facility. Aria Group's highly trained and talented painting staff produces Class A surfaces for automotive show car projects regularly using custom mixed colors and paints. Aria Group's dedicated painting facilities include a heated Blowtherm extended paint booth and dedicated preparation stations with high flow dust control filtration. Aria Group's fabrication department includes a full metal machine shop and tools, two secure build bays with surface plates and measuring equipment, and fabrication/fixture tables suitable for armatures. We also offer a wide range of metal forming machines (bending, welding equipment, mills, lathes), tube frame and uni-body chassis fabrication. Aria has a highly skilled fabrication team which is equipped to execute every fabrication challenge accurately and efficiently. The team works closely with the other departments to complete full running prototypes, crash test vehicles, and show cars. The proper execution of meticulous components is essential for a great prototype. That's why Aria has dedicated an entire department to expertly manufacturing detailed components like headlines, taillights, interior buttons, instrument clusters, and other smaller components. The hard modeling department is staffed by a highly qualified team of experts with many years of experience. The team takes advantage of the latest rapid prototyping machines to create 3D parts and complicated assemblies from data with precision and efficiency. Aria offers a full in-house clay modeling facility that allows clients to visualize their designs in clay. This enables the designer to realize the design and check the form, volume and proportion prior to moving forward with a final product. If any changes are needed, our skilled clay modelers simply add or remove clay to achieve the desired design. With two fully equipped design studios, Aria has the ability to build clay models of all sizes from 1/4 scale up to full size cars and planes. The Aria workshop offers a unique leather trimming facility. Aria’s years of experience in trimming full show car interiors has expanded to offering upholstery solutions to individual clients for luxury products such as private jets and luxury yachts. The department is well versed in sourcing and working with a variety of materials from OEM automotive leathers & Alcantara to custom tanned, printed and embossed leathers. Aria’s experience and knowledge in upholstering ensures the best quality and result for any interior design. 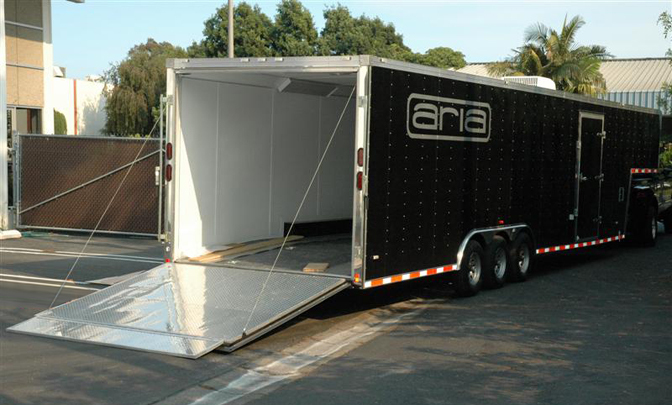 To better serve our clients, Aria also offers a full Vehicle Support including fully enclosed and temperature controlled transportation. We offer onsite support during photoshoots, internal reviews, or even trade shows. Aria can provide pick-up and drop-off services of models, tooling, parts, vehicles, and other projects via its climate-controlled, custom designed transport.